The Phillies announced today that Pete Mackanin will not return to manage the club in 2018. Rather, Mackanin has agreed to a contract extension to join the front office and serve as a special assistant to general manager Matt Klentak. Mackanin will finish out the current season as the Phillies’ skipper. The news comes as somewhat of a surprise, as it was only May 11 that the Phillies gave Mackanin a vote of confidence by extending his managerial contract through the 2018 campaign (with a club option for the 2019 season). Ken Rosenthal of The Athletic tweets that a friend of Mackanin’s described him as “shocked” to receive the news that he won’t be returning to his post next season. Beyond that, the Phillies’ play has improved substantially with the second-half arrivals of Rhys Hoskins, Nick Williams and Jorge Alfaro, among others. The Phillies entered the break with a record of 29-58 but have since played at a near-.500 clip. Overall, the Phillies played at a 172-237 pace under Mackanin, though he was tasked with overseeing a clearly rebuilding club that was never expected to win many games. 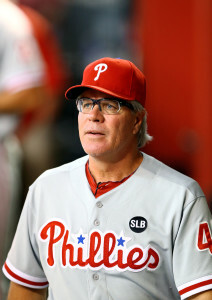 Mackanin, 66, spent parts of nine seasons as a Major League infielder, including two with the Phillies, and had a pair of half-season stints as a big league skipper prior to taking on that role with the Phillies. He’s served in various capacities over the life of his post-playing career, including spending time as a third base coach, a bench coach, a minor league manager and a Major League scout. The Phillies didn’t offer any specific details of what his new role will entail beyond the fact that he received a contract extension upon taking the position. Given that, it seems clear that the Phillies still value Mackanin’s input and feel that his presence can be beneficial to the organization. However, Klentak and team president Andy MacPhail were not with the organization when Mackanin was named manager back in 2015, and they’ll now have the opportunity to bring in their own manager. The Philadelphia vacancy creates two openings for new skippers around the league, as the Tigers have already announced that Brad Ausmus will not return as the manager in 2018. A third opening seems all but certain to emerge in the coming days, as multiple reports out of New York have indicated that Terry Collins is extremely unlikely to return as the Mets’ manager in 2018. The Phillies have announced an extension of the contract of skipper Pete Mackanin. He’ll receive a two-year deal that covers this year and next, with the club holding an option over one additional season. Mackanin had agreed to a similarly structured deal in the spring of 2016, which left the Phils committed for two seasons with an option for 2018. Now, the sides have effectively pushed that arrangement out another year, with the option season arising in 2019. The 65-year-old Mackanin took the helm in Philadelphia as an interim replacement for Ryne Sandberg back in 2015. His performance with a club in transition earned him a longer stint, and he’s now entering his second full season running the dugout. There hasn’t been much in the way of on-field success since Mackanin was named manager; the club carries a rough 121-161 record. But immediate results are far from the top priority for the rebuilding Phils, who are hoping rather to develop a core of young players who’ll help drive an organizational resurgence in the seasons to come. As ever, there have been some ups and downs in that pursuit, but it seems the organization’s brass remains favorably disposed toward Mackanin’s handling of the clubhouse. The Phillies have announced that manager Pete Mackanin has been signed to a new contract that will cover the 2016 and 2017 seasons. The deal also includes a club option for 2018. This fresh contract overwrites the extension Mackanin received just last September when the Phils removed his interim tag and made him their official manager for the 2016 season. That older deal gave Mackanin a guarantee for 2016 and a club option for 2017, whereas this new contract adds an extra year of security for the 64-year-old. 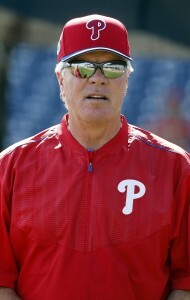 Prior to taking over managerial duties, Mackanin served as the Phillies’ third base coach and bench coach in two stints with the club since 2009. This is Mackanin’s first non-interim managerial job in the bigs after a long career of coaching and managing at both the Major League and minor league levels. The Phillies have officially begun their GM search, as Andy MacPhail told reporters, including MLB.com’s Todd Zolecki, that they’ve interviewed one candidate. MacPhail, unsurprisingly, declined to specify the candidate in question, though he said the goal is still to have a new GM in place by the team’s organizational meetings, which begin on Oct. 26. Via Zolecki, MacPhail also said the Phillies aren’t likely to spend on top-tier free agents this winter, though he didn’t completely shut the door. “[D]o you really want to commit after you’ve just been in that pool and suffered from it?” MacPhail asked rhetorically. “Do you really want to commit at this stage? The only caveat I give you is that if there’s a unique opportunity out there, I wouldn’t want to preclude it from happening … particularly when you consider that once we get to ’17 we are really pretty footloose and fancy free.” The Phillies have no contracts guaranteed beyond the 2017 season. The Philadelphia Inquirer’s Jake Kaplan writes that Phillies players are excited by the news that manager Pete Mackanin was extended through the 2016 season. Kaplan offers quotes from a number of young players, including Ken Giles, Jerad Eickhoff, Aaron Nola and Cameron Rupp, who have thoroughly enjoyed playing for Mackanin, whose new contract also contains a club option for the 2017 campaign. The Phillies have extended the contract of manager Pete Mackanin through next season, according to a team announcement. Philadelphia will also add a club option for the 2017 campaign. Mackanin stepped in mid-year for the basement-dwelling Phils amidst significant organizational turmoil. When then-skipper Ryne Sandberg resigned in late June, Mackanin was given dugout duties on an interim basis. Not long thereafter, Philadelphia brought in new president Andy MacPhail and ultimately fired GM Ruben Amaro Jr. While the general manager’s seat remains open, the Phillies apparently decided that they had seen enough positive results from Mackanin to keep him as the top uniformed personnel member. Philly is just 30-46 under Mackanin’s leadership, which isn’t much better than they were with Sandberg, but the team was never expected to contend and has also dealt with the loss of several more key veterans. Of course, Philadelphia is less concerned with immediate results than it is with development at this stage, and Mackanin has overseen a fairly promising arrival of younger players. 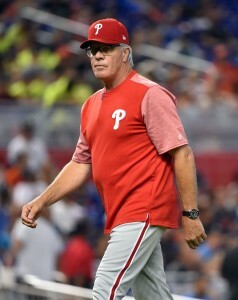 Having already helped to welcome key names such as Maikel Franco and Aaron Nola to the big leagues, Mackanin will be responsible for overseeing their continued maturation and the ongoing introduction of youthful talent onto the big league roster. Mackanin is a veteran baseball man, but this will be his first non-interim managerial stint. He has previously spent time as a stop-gap skipper for the Pirates and Reds. Before his more recent turn as the Phillies’ third base coach, Mackanin was the team’s bench coach over 2009-12.